Everywhere I look people are using their iPads or iPhones to get work done. I don't think I have taken my MacBook Pro out of my house in over a year. With the exception of creating web pages, I seem to be able to do everything I need to do on one of my iOS devices. Here are a couple of tips that might make your life easier and speed up your work. I frequently need access to currency symbols other than the US dollar ($) when I write up product reviews. When that happens and I’m using my Mac, I have to open the Character Palette (Character Viewer) and then select Currency Symbols, and then find and insert the one I need. Bonus Tip: to show the Character Viewer in Mavericks, open System Preferences > Keyboard, and check "Show Keyboard & Character Viewers in menu bar." A square icon appears in your menu bar, and by clicking on that square, you can Show Character Viewer. If you're clever, you might remember that Option-3 is a keyboard shortcut for £, and that Shift-Command-2 will get you the € symbol, but I can never remember that. Besides, there's another advantage to the Character Viewer in that there is a name attached to each symbol. I find that useful. If I am using my iPad or iPhone I don’t have access to the Character Viewer, but I can still access to the most common symbols. When you need to insert a currency symbol, tap and hold the $ sign. A quick menu pops up and you can choose the symbol you want by sliding your finder to it. Those available are the yen sign, euro sign, dollar sign, cent sign, pound sign, and the won sign. 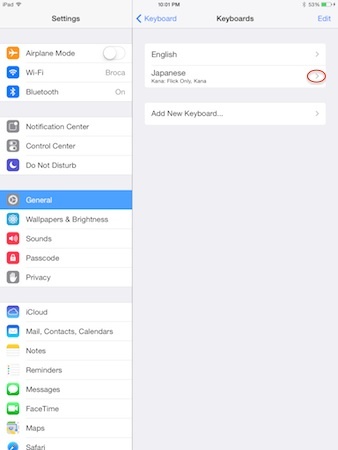 In the Settings app tap General > Keyboard > Keyboards > Add New Keyboard. You will find a long list of languages. Choose one that meets your needs. 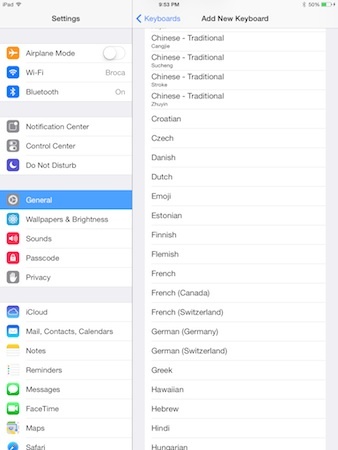 When your new language keyboard shows up in the list, tap the arrow and select any options you want. Next time you open an app to enter text you will see one of your chosen keyboard layouts, plus a globe icon and alternate keyboard options. Tap your choice and begin. The globe icon allows you to switch between keyboards, or you can choose one of the options listed there. You can delete a keyboard at any time by clicking on the Edit button in the top right corner and tapping the minus sign next to the appropriate language. Click done when through. I hope you find these tips to be useful .